we did not inherit it! From the small printing-houses at the centre of Athens where packaging and laboring that is done by hands, to the large printing companies with automatic packaging presses we offer top-notch services to our customers. Our company manages, finances and installs solutions, even for the most demanding paper collection for recycling. Since its establishment in 1973, our company is the essential partner for many enterprises that need constant and long-lasting partnership without any problems to the collection of their paper for recycling!!! 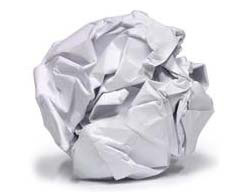 Paper is raw material, energy and collecting it protects our fragile environment. Recycling lowers both raw material and energy consumption, thus minimising the gasses that cause the GreenHouse effect. Recycling is a fundamental methodology in modern garbage management. Recyclable materials can also come from other sources, including our homes, civil services and industries. If everyone in Greece recycled their paper 3.84 million tons of carbon dioxide would have never reched the atmosphere. The energy that can be secured by recycling comes to the ammount of energy used in Athens for 4 months.